This was my favorite rhubarb dessert when I was a kid. It wasn’t my Mom’s though, so I would rush out to the rhubarb patch and pick a bunch of rhubarb so as to convince her to make it. (I think this is the only reason I would ever go willingly to get anything from the garden.) We would have it with Carnation milk poured over top, or ice cream if we were really lucky. 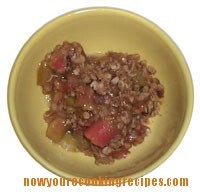 Rhubarb with oatmeal crunch topping, great served with ice cream. In a medium bowl combine melted butter, flour, rolled oats, brown sugar, cinnamon and salt. Mix until crumbly. Press half of the mixture into an 8 or 9 inch baking dish. Arrange rhubarb over top of the crumb mixture. In a small saucepan mix the white sugar and cornstarch. Stir in the boiling water. Cook and stir until thick. Remove from heat and stir in vanilla. Pour syrup evenly over the rhubarb. Sprinkle remaining crumb mixture over top. Bake at 325 degrees F. for 50 to 60 minutes, until topping is golden and the rhubarb is tender. Serve warm.